Naim Audio is a UK specialist hi-fi manufacturer with an impressively successful track record stretching back 30 years. I acknowledge a personal preference here -- Naim components have long been among my favorites, more for their fine ability to communicate the musical message than for any sonic sweetness or delicacy. They have also shown exemplary reliability. Amplifiers and preamplifiers have always formed the heart of Naims activities, and the company has always set its own unique agenda. No Naim preamp has ever had tone controls, for example, even back in 1973, when omitting them was hi-fi heresy. Only recently has the company begun to include the odd pair of phono sockets alongside the regular DIN sockets it prefers for grounding reasons. Naim continues to plow its own furrow, especially in the techniques it uses for linking components to each other. 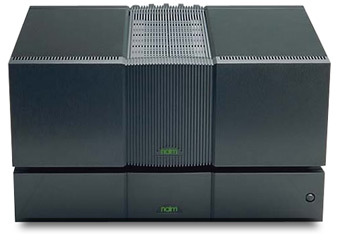 Naim amps tend to work particularly well with the companys other components -- tuners, CD players, even its defiantly low-tech interconnects. System synergy has always been at the heart of the Naim philosophy, alongside clever arrangements that allow the customer to upgrade a system in a series of affordable stages. That doesnt apply in this case. The NAC 552 and NAP 500 are now, respectively, the tops of Naims lines of preamps and stereo power amps. The last few years have seen major changes in a range that had stayed much the same since the companys inception; these two new models encompass the latest styling, the latest power transistors, and Naims latest thinking on sound quality. At $22,400 USD for the NAC 552 preamp and $21,950 for the NAP 500 power amp, this costly amplification is roughly twice the price of Naims previous top-end kit. A key aspect of nearly all Naim gear is the separation of the power supplies from the signal-carrying components, and the NAC 552 and NAP 500 are no different. Each model consists of two chassis: one containing the transformers and multiple regulators, the other containing the actual signal circuitry. The preamp and both power supplies are classically slim, full-width components. The NAP 500 power amp is a much chunkier affair having the same footprint but with roughly twice the height. Both models use substantial hawser-like multiway connecting cables with hefty, multipin, Burndy locking connectors (borrowed from medical technology). These are supplied as part of the package to deliver the requisite power to the various stages of the pre- and power amps: the 552 has some 18 separate supply feeds, the 500 a total of 12. Also supplied are the core interconnects between pre- and power amp -- a curious combination of four-pin DIN and XLR -- while another DIN lead carries the front-panel display power to the preamp. The speaker terminals, too, are idiosyncratic, consisting of just two 4mm sockets for each channel; matching plugs are supplied, and the dealer is expected to solder these to appropriate lengths of Naims NACA5 speaker cable. Other cables can be used (provided 4mm plugs can be fitted), though not high-capacitance, low-inductance types; check cable compatibility with your dealer. No slave to fashion, Naim still sticks to a near-black matte finish for its very solid, chunky casework. Discreet green illumination highlights the selected buttons and the logo, and shows the settings of the two rotary knobs. The amps faceplates follow the attractive triptych styling motif that Naim introduced around the millennium, but the pièce de résistance here is the massive cast-alloy heatsink occupying the rear panel of the power amp -- bit of a shame to hide it round the back! Theres also a central ventilation "chimney," backed up by silent, thermostatically triggered fans; but the hefty heatsink serves to maintain good short-term thermal stability. As is increasingly common these days, the NAC 552 is part preamp, part computer, a configuration that increases functionality and flexibility but at the cost of extra complexity and, possibly, unreliability. Performance-led features include the use of a split-rail power supply to minimize noise and improve dynamic range. The chassis sit on solid, hard feet, their internal circuit boards completely spring-decoupled and thus fully isolated from vibrations. Theyre shipped with four transit bolts fitted in place. Both 552 chassis are exceptionally heftily built, each weighing some 30 pounds. Theres full remote-control operation via the appropriately named Flash remote handset. This rather bulky, cumbersome device has a large and helpful LCD screen, and its required -- the 552 cant be programmed without it. Large knobs on the 552s front panel provide control of volume and balance, and two rows of eight buttons each independently select among the six inputs, six record outputs, and the Mono and Mute modes. There are actually nine stereo inputs in total, all single-ended and operating only at line-level. Any six of these can be selected from a collection of rear-panel sockets that includes six five-pin DINs, two phono pairs, and one special DIN (explicitly intended to connect and supply power to Naims Stageline or Prefix outboard vinyl replay stages, or its Headline headphone amp). Three of the DINs deliver record out, and two of them can be set for fixed unity gain for use alongside multichannel A/V processors. Just which sockets are used is up to the operator, who can also decide which should be mapped to which button on the front panel and remote. A small LED next to each socket blinks briefly when that socket is selected. Other features include a Display Off mode and optional automatic input selection. A cornerstone of Naim power-amp design has always been to stick to single power transistors, avoiding the widespread technique of paralleling multiple devices in order to achieve high power. Six years of collaboration between Naim and a semiconductor manufacturer have resulted in a new bipolar transistor that combines very high current and power ratings with wide bandwidth. To achieve the right relationship between voltage and current delivery, and also to reduce ground-modulation effects, each channel uses two power-amp stages operating in bridged mode. The result is a design with five times the internal bandwidth, a quarter the distortion, and a much lower operating noise floor than its predecessor, the NAP 135, and a claimed power output of 140Wpc into 8 ohms. Although the NAC 552 and NAP 500 form a natural partnership, the 500 was introduced way back in 2000, while the 552 reached the shops only toward the end of 2002. I therefore got to spend plenty of quality time with the power amp long before the preamp came on the scene. Source components included the following: Naim CDS 2, Rega Jupiter CD players; Linn LP12 turntable, Rega RB1000 tonearm, Linn Akiva, Dynavector XV-1 low-output moving-coil cartridges; Magnum Dynalab MD 102 FM tuner. A number of loudspeakers were used during the evaluation: JBL K2 S9800; B&W Nautilus 800; JMlab Grande Utopia Be; Neat Ultimatum MF9; Dynaudio Confidence C2; Wilson-Benesch Chimera; Naim SL-2; Tannoy Dimension TD12. Speaker cables rounding out the system included Naim NACA5, and Nordosts SPM and Valhalla. During the long period of time the Naim components resided in my system, I listened to: White Stripe, Elephant [V2 27148]; Hot Tuna, Live at Sweetwater II [Relix C1290182]; Lambchop, Is a Woman [City Slang 201902]; The Grateful Dead, Reckoning [Arista A2CD-8523]; Alison Krauss & Union Station, Live [Rounder 610515]; Shostakovich, Symphony 11, Mstislav Rostropovich and the London Symphony Orchestra [LSO Live 30]; Christy Moore, At the Point: Live [EMI 532748]; Eva Cassidy, Time After Time [Blix Street 10073]; Tom Waits, Rain Dogs [Island 422-826382-2]; Mari Boine, Eallin [Lean/Sonet Antilles 533799-2]; and John Rutter, There is Sweet Music, Cambridge Singers [Telarc CD-80273]. I also listened extensively to BBC Radio 3 and 4. I connected the NAP 500 in place of the Naim NAP 135 monoblocks Id been using, and fed it from Naims previous top preamp, the NAC 52. The results were immediately very positive, even before the new power amps circuits had been properly warmed up. The surprise was that the NAP 500 actually sounded quite different from the 135s, and obviously superior. The sound was rather less dramatic, and seemed to somewhat underplay dynamic expression, which might not appeal to everyone. But whereas the 135s have great zest and a bouncy vigor thats very engaging, theyre clearly less well controlled, with significantly greater coloration, much less transparency, and much more low-level hash. The 500s bottom end seemed both cleaner and more neutral than the 135s, but the really big improvements came further up the spectrum, in the upper-mid and "presence" zones, where the sound was altogether less congested, with a much wider dynamic window. The top end was much sweeter and more delicate. Two and a half years later I did a similar substitution, this time replacing the NAC 52 preamp with the new NAC 552. Straight from the box, the 552 performed a trick very similar overall to the NAP 500s. The 552s superiority was immediately obvious, with the biggest benefits heard at the top end of the band, which became sweeter, more open and detailed, and subjectively more extended. Midband coloration was significantly reduced, with less nasality on speech and a greater sense of all-round solidity. The NAC 552s bass was cleaner, deeper, and more confident, and its resolution was better at both ends of the audioband. But the preamps most dramatic strengths were its remarkably wide dynamic range and the associated resolution of subtle low-level detail. The NAC 552 and NAP 500 worked beautifully together. If I had to choose just one of them, it would have to be the preamp, which proved very effective at feeding and highlighting the differences between a number of different power amplifiers. The strength of Naims new pre/power-amp combo lay much more in its musical communication skills than in its sound quality per se. There was plenty of detail that extended well out to the frequency extremes and covered a wide dynamic range, but it didnt have quite the midband delicacy and transparency of a tube amp, or the top-end sweetness and subtlety of switch-mode-supplied solid-state models. Where the Naim combo really scored was in the way it kept the sound time-coherent from top to bottom, and avoided emphasizing any part of the spectrum. The bass might have had a little less sheer weight than some pairings of amp and preamp, but its drive, momentum, speed, and timing -- all of which have a lot to do with the ease of communication -- were superb. The sound was unmistakably solid-state: fine neutrality with some opacity, and without the warmer, more romantic qualities of tubes. The sound might be just a bit too matter-of-fact for some tastes, but the Naims neutrality was their real strength -- the way they just got out of the way to let through the maximum amount of musical information. The NAC 552 lacks a built-in phono stage, but when I used it to power a Naim Prefix phono stage in place of my regular HiCap outboard supply, I heard a much more obvious improvement in vinyl replay than Id expected to. This is a fit-and-forget combo that did just what I wanted it to while drawing little attention to itself. Characterless is a word that springs to mind, though ultimately the Naims did have a slight forwardness and a mildly shiny quality that actually works very well with the slightly opposite character found in the majority of loudspeakers. By any standard, Naims combination of NAC 552 preamp and NAP 500 power amp is expensive. Its sound quality is essentially neutral and well-behaved, if perhaps unexceptional by high-end standards. But in the rather more important task of conveying the vital messages behind the sound -- the musical information and subtleties -- the NAC 552 and NAP 500 have proved more than a match for any of the competition Ive heard. Prices: NAC 552 Preamplifier, $22,400 USD; NAP 500 Power Amplifier, $21,950 USD.